Summer is a great time for BBQ's, beach days and well, quite honestly none of these events are complete without some sort of fun cocktail or boozy dessert. Which is exactly where these came in. 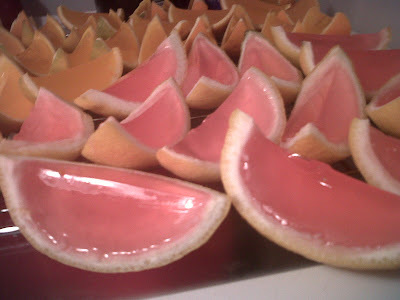 While I have never really been a big fan of Jello shots mostly because they always seem to get stuck in the little cups so when I saw these (on where else but Pinterest!) I thought they would be a perfect opportunity to spice things up a bit! My little sister though, beat me to the punch on these. I had been waiting for an opportunity to make watermelon flavored jello in lime rinds when she sent me this picture. So I'm going to give credit where credit's due and say they were delicious and now I know for sure that I will be making them in the near future. These shots are super easy to make and really make an impression with your guests. Dissolve the Jello mix in a small bowl of boiling water. In the meantime cut each orange in half and remove all of the flesh from inside. Once all of the Jello has dissolved add in the vodka, stirring until it is fully incorporated. Next pour the Jello in the shells and refrigerate about 4 hours or overnight (I prefer to do these the night before so I know they have set completely). Once the Jello is set slice each orange into 4 slices. Wow! Such a great idea! It's always hard to get the jello out of that little cup. This looks so cute and like it would be fun to eat!